Adzooma is an online advertising platform with solutions to help both new and existing advertisers grow their online presence. The ‘done for you’ service is designed to get businesses online and start attracting more customers. This is achieved through custom-made business web pages and the option of completely hands-off online advertising. 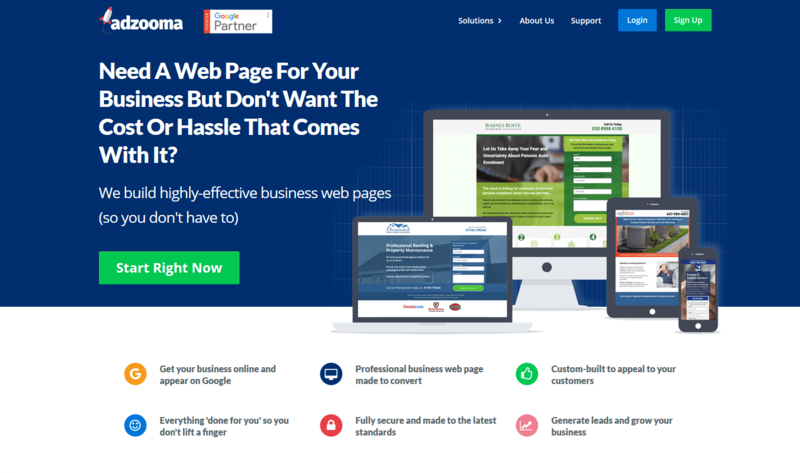 Adzooma offers the following features: Professional design and copywriting, a fully responsive, custom-made business web page, and optional advertising campaign creation and management. Adzooma also offers a free 1-minute PPC health check for those running Google Ads campaigns. This service features a detailed report analyzing Google Ads performance, suggestions to reduce wasted spend and increase conversions, identification of missed opportunities, and tips to improve quality score and clickthrough rates. Adzooma Pro is an online platform that constantly analyzes Google Ads account performance, making regular suggestions for improvement. Most of the suggestions are actionable with Adzooma with just a single click. Still not sure Adzooma is right for you? Use our Product Selection Tool to compare other Marketing Software solutions. Have questions? Call one of our unbiased Technology Advisors for a free consultation. Learn everything you need to know about Adzooma. Our experts will reach out to you shortly.